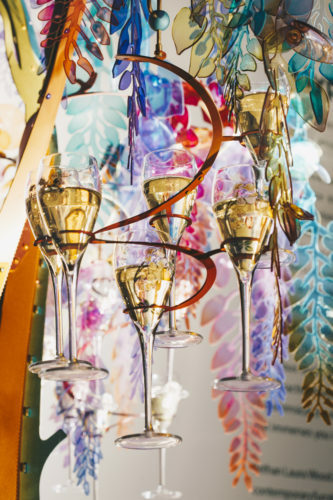 December 2018 - Maison Perrier-Jouët x Bethan Laura Wood at Design Miami/ Art of the Wild is spreading its extravagance through Miami with the HyperNature experience. 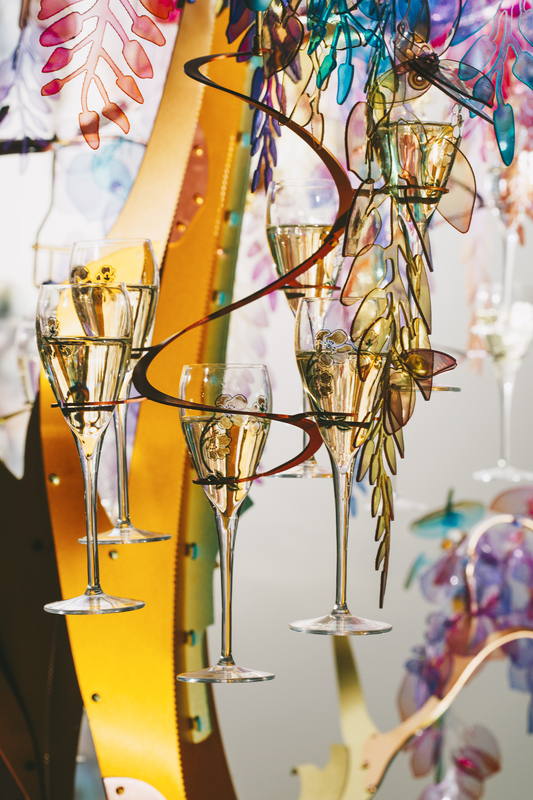 Art and nature have been an integral part of Maison Perrier-Jouët since its foundation in 1811. 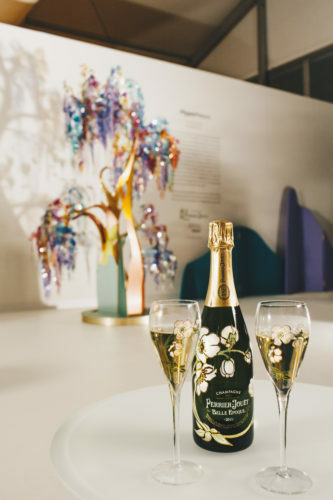 Today, this cultural heritage translates to the creative liberty and unconventional observations of nature illustrated by Art of the Wild: the extravagant universe seen by Maison Perrier-Jouët to re-enchant the everyday through the presence of unbridled nature. 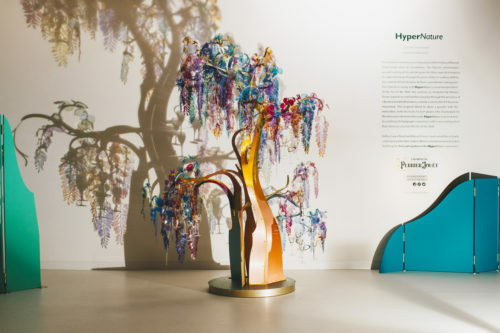 British designer Bethan Laura Wood has presented the Maison with a dazzling interpretation of this singular vision of the world, which will be on display in Miami in the form of a vibrant creation called HyperNature. 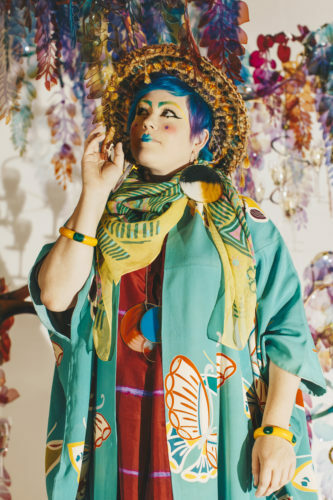 The story of HyperNature began with an encounter: ‘Maison Perrier-Jouët commissioned Bethan Laura Wood because she embodies the exuberance of Art Nouveau, a movement that forms part of the Maison’s cultural heritage, but also for her capacity to develop a multidisciplinary artistic practice while maintaining her own signature style. 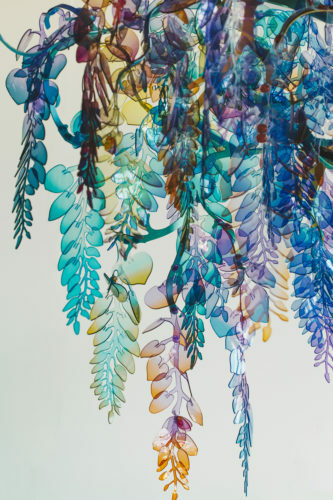 Within her work, largely inspired by nature, Wood demonstrates an ability to convey meaning through her unique use of colour and form. 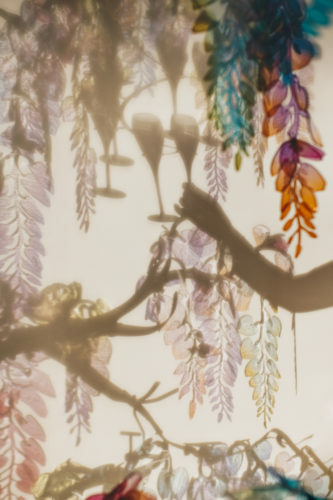 These traits allow her to fully capture the essence of Art of the Wild’, explains Axelle de Buffévent, Style Director at Maison Perrier-Jouët. 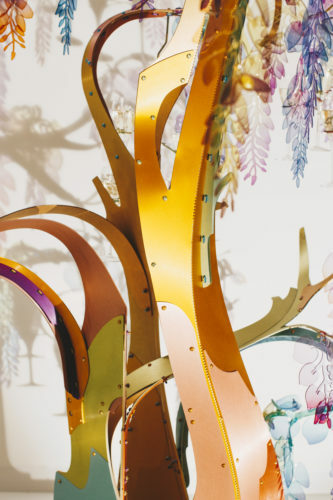 Wood has designed a tree for the Maison named HyperNature , whose curves, petals and colours were inspired by a journey to Champagne several months ago. While visiting the Maison Belle Epoque, the family home of Maison Perrier-Jouët in Epernay, the designer was immersed in Art Nouveau. Her palette of references was enriched by the floral universe of the artistic movement present in every detail of the house, like the arched, wooden doorframe designed by Hector Guimard, the tones of the stained-glass windows and the emblematic anemone motif designed by Emile Gallé for the Maison in 1902. The context of the industrial revolution that was occurring simultaneously to the Art Nouveau movement drove Wood to use industrial materials but place them in the context of the world of luxury, treating them with an artisanal level of care and respect. A notable feature of her work is broadening perspectives of materials with negative connotations by proposing alternative uses for them. 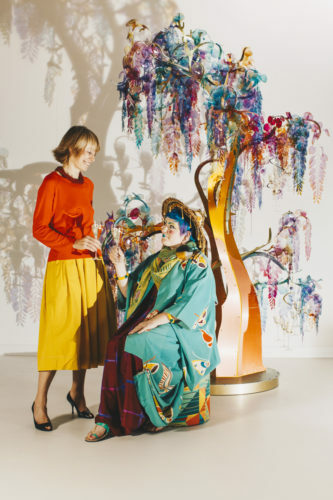 To realise her creative vision in a range of mediums, it is important for Wood to collaborate with specialised artisans: for HyperNature , the petals were hand-dyed with fellow designer Fabien Cappello in Wood’s London studio, and the aluminium branches were produced and anodised by innovators Neal Feay in the US. Free in form, intense in colour and radiant by its presence, HyperNature is the purest expression of Art of the Wild, but, first and foremost, it provokes an emotional reaction. 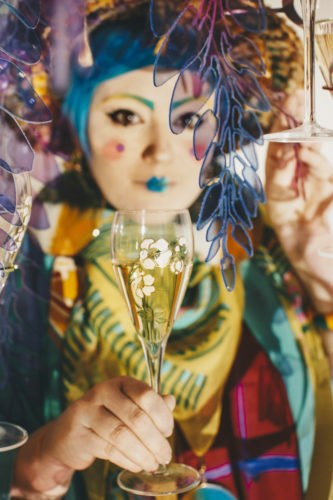 Beyond the tangible design, HyperNature is a whimsical champagne experience; a new tasting ritual that immerses you into the Art of the Wild. 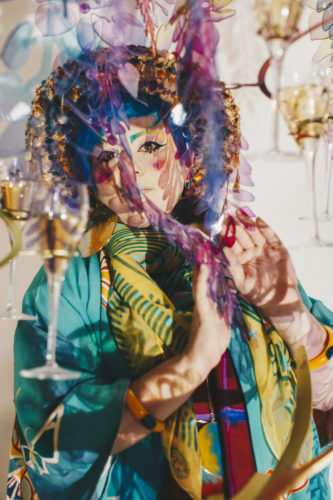 ‘I wanted to highlight the luxurious, memorable occasions on which we drink champagne by enhancing an element of fantasy within the tasting ritual. 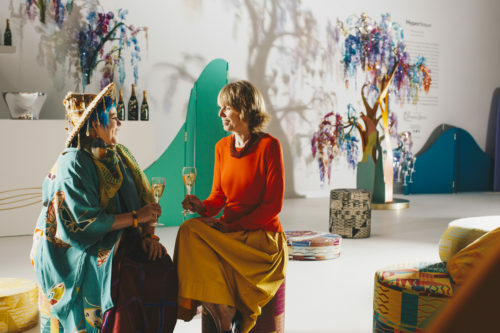 I also looked for a balance between the striking visual impact of the tree and the delicacy of the Perrier-Jouët champagne tasting ritual’, explains Wood. 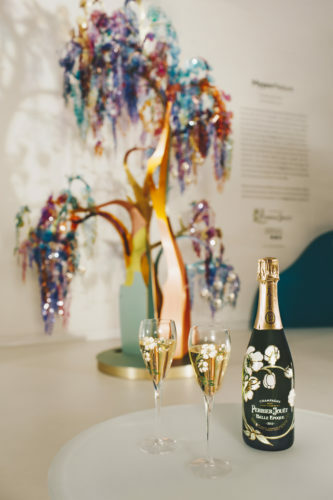 The designer also spent time with Cellar Master Hervé Deschamps, the guardian of the intricate, floral signature of Maison Perrier-Jouët’s champagnes. Together, they explored the exceptional vineyards of the Maison that inspired Wood to draw a parallel within HyperNature with the meticulous work necessary to turn grapes into champagne. HyperNature mirrors the action of the harvest by allowing elements – a single glass of champagne or an entire branch with multiple glasses – to be ‘plucked’ from the structure, as one would a grape from a bunch or a bunch from a vine. At the root of this tasting ritual, Wood references the terroir and the savoir-faire of Maison Perrier-Jouët. 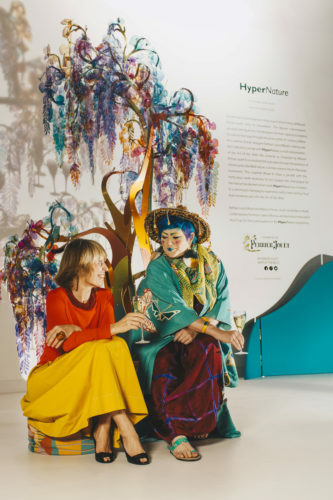 For the seventh instalment of its annual partnership with Design Miami/, Maison Perrier-Jouët presents HyperNature in the Collectors Lounge, a space entirely taken over by Bethan Laura Wood with the spirit of Art of the Wild. HyperNature will be unveiled among pieces from the designer’s recent collaboration with contemporary furniture manufacturers Moroso, creating a vivid, joyful atmosphere. 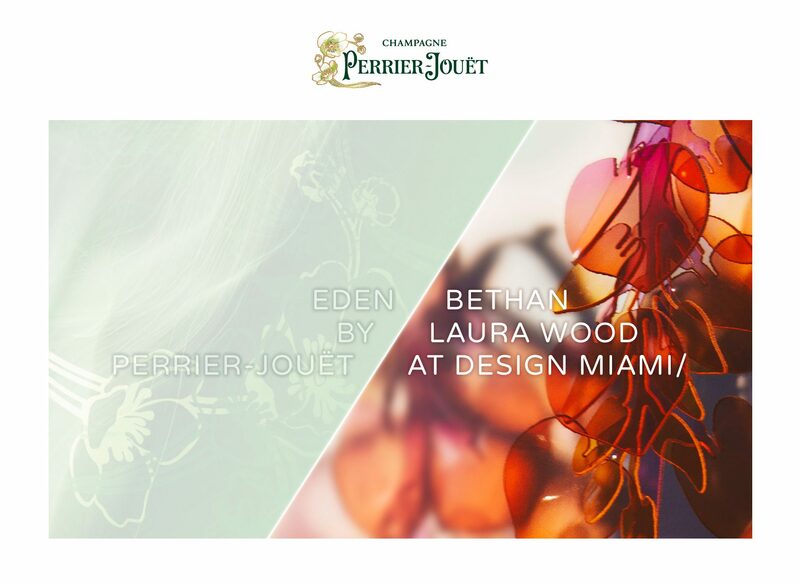 To make the most of the Design Miami/ experience, Maison Perrier-Jouët will also present EDEN by Perrier-Jouët at the Faena Hotel on the 5th and 6th of December, an immersive experience that delves into the House’s identity. A series of vibrant events surrounding HyperNature will enchant Miami day and night with an exuberant initiation to its Art of the Wild universe. 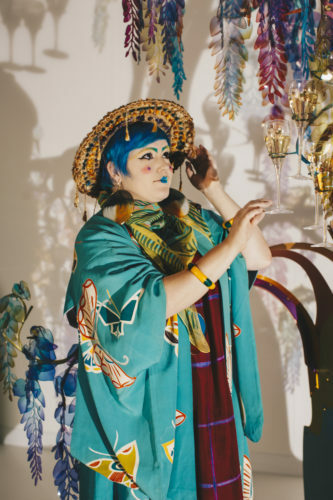 Blurring the boundaries between art and design, Bethan Laura Wood’s practice establishes a dialogue between her work, the audience and the wider world. Through her travels she has observed ‘those crossover spaces between nature and manmade’, which she draws on to enrich her palettes, structure atypical forms and refine her understanding of the cultural connotations of materials. These elements allow her to elevate the mundane into the extraordinary, an exercise which Wood excels in.